LINCOLN, Neb. 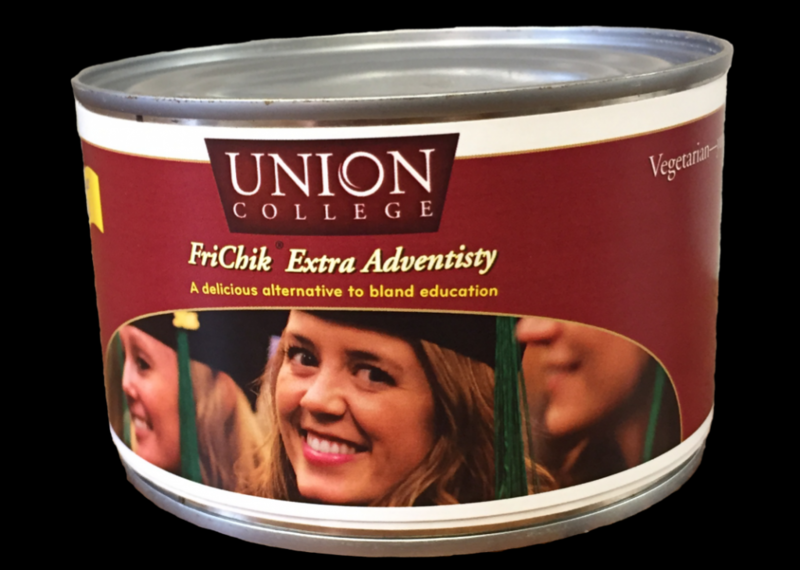 --- The minute word got out that Union College had issued special edition FriChik cans, orders came pouring in from End Times enthusiasts in mountain cabins everywhere. The FriChik cans sporting special Union College labels had originally been intended as promotional giveaways. However, the words "Extra Adventisty" on the labels sparked enormous interest in wild-eyed wilderness Adventists the world over. "My hilly hideout was already fully stocked with a huge range of Loma Linda veggie meats, assorted charcoal products and Little Debbie treats," said long-time Adventist and orienteering expert, Harma Giddon from an undisclosed cave location. "But as soon as I got wind of these extra Adventisty FriChik cans I realized my complete lack of preparedness." Giddon said she had no idea what Union had put in the cans to make them just that little bit more Adventist. "All I know is that I am not going to let anyone out-Adventist me with their TOT stash." Hey, Harma-How come you didn’t mention your stash of Little Debbies? I have mine all hoarded up in a secret hide-a-way. Only I know how to get there. See you at the end! !